Be amazed by what you think you see and thrilled by what actually appears before your very eyes!! 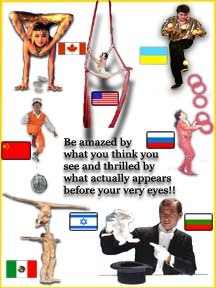 Incredible Circus performing Fabulous Feats of Agility and Dexterity!! Pyrotechnic Magic, Beautiful Girls and Thrilling Spectacle in all new Cabaret Revues!! Dancers Twirling in a Pulsating Fantasy as Daggers Fly through the Air!! Sparks Fly as Shields and Sables lock in Battle upon a Brilliant Stage!! Our incredible performers steal the show at tradeshows and conventions! Book our attractions into your booth or for your Corporate Event and get the attention and traffic you want. specializes in unusual and fun entertainment for Conventions/Corporate and Special Events! Experts at producing entertainment tailored to your requirements, our resources allow us to draw from an unprecedented pool of talent. From Corporate Events for World Wide Conglomerates like Pepsi-Cola to the popular new Family Outings known as First Nights to Half-Time Shows for Major League Basketball, Football and more, we produce it all! We do Private Adults and Children Birthday Parties, Corporate Events, Festivals, Fairs, Conventions, and Casinos.